The Tour makes the short drive from Augusta to Harbour Town for this year's RBC Heritage. The event is one of the players’ favorites for the laid-back vibe that comes with Hilton Head one week after the season's first major championship. This year's field is the strongest in the last ten years and headlined by the world's top player and South Carolina native Dustin Johnson. Full field and tee times. Last year saw Wes Bryan become the first South Carolina native to ever win the Heritage. Bryan shot a final round 67 to beat out Luke Donald by one shot and claim his first PGA Tour title. Bryan's win came one year after earning a battlefield promotion to the PGA Tour after winning three events on the Web.com Tour. The Pete Dye-designed Harbour Town was one of the most pivotal courses in the history of golf course architecture. When it opened in 1970, Harbour Town's angular and strategic design was a far cry from the era's status quo of penal design. Harbour Town's design was met with acclaim from the golf world and changed the way golf courses were built. Today, Harbour Town remains relevant, providing a different type of test than the typical PGA Tour course. Success at Harbour Town centers around hitting tee shots on the correct line and distance to set up angles to approach the small greens. It's a rare course where power takes a backseat to precision off the tee. The strategy at Harbour Town derives from the large trees that Pete Dye routed the course through. The trees have grown over the past 50 years and today, Harbour Town could use a pruning to open up some of its corridors. Over the years, players that rely on skills beyond power (think iron play and short game) play well at Harbour Town. Harbour Town has yielded high finishes to a few players year in and year out. Luke Donald has finished in the top three seven of the past nine years. Jim Furyk has won the RBC twice and notched three other top 15 finishes in the 2010's. In his last four appearances at the RBC, Matt Kuchar has a win and his worst finish was a t11th. Two players who have the chance to develop similar records at Harbour Town are Kevin Kisner and Wes Bryan. Kisner has notched a 2nd and t11th in his three appearances, and Bryan won in his debut. As alluded to earlier, these players don't depend on the long ball for success. South Carolina native Dustin Johnson will tee it up at Harbour Town for the first time since 2009. The world's top-ranked player missed the cut in his two appearances at Harbour Town ('08 and '09). A handful of players have a track record of success at Harbour Town. Here's who Paulie likes of that group plus a few others who might surprise. SB Nation's Brendan Porath joined the podcast to discuss the 2018 Masters. We talked about our takeaways from Patrick Reed's win, Rickie's near miss, Spieth's surge, Rory's rough final round and much more. Listen to the podcast on iTunes, Stitcher or the website. If you enjoy the podcast, please rate and review it in the Apple podcast app. 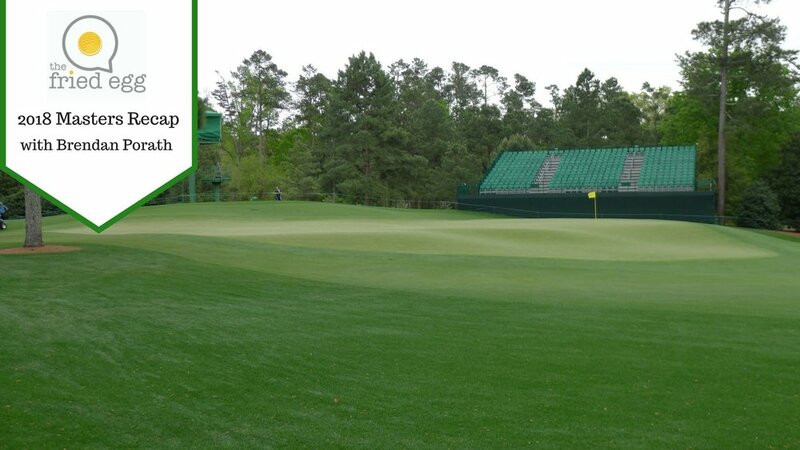 In case you missed it, I dove into the scoring data from the past 35 years of Masters competitions to understand how changes to the course, like lengthening and tree plantings, have affected the course and competition. Read it here. The long-expected announcement of the PGA Tour cutting ties with its longtime WGC host, Firestone, became official. Starting in 2019, the tournament will move to Memphis, TN to appease the Tour’s biggest sponsor, FedEx. The event will likely be hosted at TPC Southwind (thumbs down) and held in August when the average temperature is 92 degrees and rains 30% of days. From a financial situation, this move makes sense, FedEx is happy. From any other standpoint, this move is a disaster. The WGC events are supposed to be the Tour’s flagship events, a rare occurrence that the world’s best players get together. A world class field deserves a world class golf course, which TPC Southwind is not.. Couple the mediocre course with Memphis’ unbearable August weather (which is bad for both fan experience and championship golf course conditioning), and it’s a recipe for disaster. The decision was driven by money, and the PGA Tour has had trouble in recent years selling sponsorships. The best way to sell sponsors is by having a good product, and this is destined to be a bad one. The Tour also announced the addition of walk-up music to the Zurich Classic. It will add a new and interesting wrinkle to the second-year team event and an exceptional fan experience for those on the first tee. Two SEC teams, Kentucky and Missouri, have already won tournaments this week. Kentucky won a tightly contested battle with Auburn to win the Gary Koch Invitational while Missouri dominated their home tournament by 11 shots. Missouri’s Hayden Buckley also won their tournament individually, his 4th win of the year. 7 SEC schools have already won tournaments this spring, a very exciting note as we start looking ahead to conference tournament season. Out west, BYU and Santa Clara shared the team title at the Geiberger Invitational at PGA West. The two teams entered the final round in 3rd and 4th place but had two of the best rounds of the day in order to grab the title. In other college news, Illinois senior Nick Hardy accepted a sponsor’s invite to the Web.com Tour’s Rust-Oleum Championship. Hardy has never played a Web.com event but has played in two U.S Opens and the 2017 John Deere Classic. Joining him as a sponsor’s exemption will be former Ohio St. player Tee-K Kelly. Both are natives of the Chicago area, where the tournament will be held in June. I checked out Gil Hanse's latest project, the Ohoopee Match Club, while in Georgia. Here are a few pictures from the visit. Club Pro Guy put together a video showing the keys to punching out.